It’s not every day that a Twitter account dedicated to promoting McDonald’s as a business, but now it’s made a statement that will either increase business or cause a boycott and hashtag frenzy. It’s all based on how you feel about President Donald Trump. If you’re a fan, you’re booing. If you’re not a fan, you’re probably eating a bag of Big Macs. 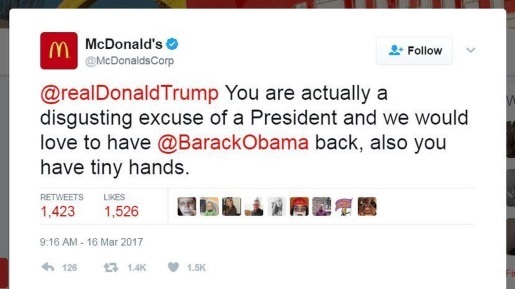 McDonald’s Corporate tweeted a highly negative statement about President Donald Trump. Of course, the tweet was only up for about 20 minutes, but that was long enough for everyone to jump on it. Trump supporters immediately started to #boycottmcdonalds while the anti-Trump side immediately started making plans to grab some burgers and fries for breakfast. Twitter immediately informed McDonald’s of the possible breach, and the tweet from 9:16AM disappeared into the Internet ether, to live on in posts like this one. To the shock of no one, McDonald’s says that the tweet was the result of a security breach. No doubt, someone at McDonald’s was not “lovin’ it” this morning when they got to work.